Follow me, says the game with a chime. A week ago, I received an email from Expand developer Chris Johnson inviting me to play the game ahead of release. Since it was a game I was already interested in, I jumped at the opportunity. Chris describes the game as a "meditative exploration through shifting circular labyrinths". It is a game that I find hard to frame my thoughts on - Chris' words are certainly accurate, but the game has another quality to it that's a little more difficult to define. "What I found interesting about creating Expand," notes Johnson in the game's press release, "Is how you can convey a lot of emotion and movement using minimal colours and patterns. The world can feel seamless as the unfamiliar space revolves around the player with no distinct loading breaks and this unfamiliarity is heightened by the soundtrack that cues off animations to the note." When I first spotted Expand, it was from across the showroom floor at PAX Australia in 2014, sitting next to the Assault Android Cactus as part of the Australian Indie Showcase, and I remember stopping for a moment to appreciate the level of diversity that that juxtaposition represented. A friend of mine had mentioned earlier in the day that they loved the game and suggested I should stop by. I lingered near the booth, hoping to get a moment to chat with the developer, but the crowd of interested players didn't show any sign of dissipating and I watched others play for a while before moving on to catch a panel. At first, Expand's circular "levels" (I'm not sure if "level" is the best word, but it's what I'm going to use here - they feel more like locations or environments in some abstract kind of way) seem like disjointed movement challenges, but it quickly becomes apparent that you are moving through a some kind of flatland-esque disc-shaped world, with sparse, but evocative cryptic instructions driving you onward through its labyrinthine settings. The game itself is fairly short (nominally 2 - 3 hours' worth of play), but for something that's so minimalist, it expands out into an experience that feels longer and larger than it is. I'm yet to reach the end, but I feel confident that the game has more to tell and show me. The game's gamepad inputs are simple - move an analogue stick to guide your avatar in that direction. The keyboard inputs are unexpectedly different, however, with right for clockwise rotation, left for counter-clockwise rotation, up for ascending towards the centre, and down to descend away. This is due to some coordinate wrangling hurdles that are easier to overcome with analogue axes than binary key presses. I generally find gamepads unpleasant to use, but in this case, I opted for gamepad controls. There's something relaxing about watching people play Expand. It gives a sense that it's a game best played when you're at peace and can let the world drift away. There are points in the game that are timed (and some points where that timing becomes tight), but in the 5 hours I've spent in the game, I'm yet to find it to feel reflex oriented. Typically, Expand gives players plenty of time and space to observe and understand the challenges ahead. In the event that the player does slip up, the level's shapes cycle and rewind back to the position of the most recent checkpoint, but offset slightly from its location when you passed there previously. This subtle, but significant change means that repetitive strain is lessened by having slightly different sets of movements to make, and over time evens out any inherent difficulty that might be caused by orientation (if you've ever tried to draw a circle, you might have found that you have an easier time drawing them in one direction than the other. After playing Expand for a little while, I began to wonder whether there were particular movements that I was less "good at" on particular orientations - thanks to this rotation on failure I never felt like that was handicapping me). There are periods in the game where the placement of checkpoints feels sparse (particularly towards the end of a set of locations). While this means that these sequences can and will take a little longer, the value of preserving pacing and flow makes this choice feel justifiable. Outside of the menu, Expand's soundtrack feels dynamic and full, bringing a sense of atmosphere whilst also enhancing the sense of deliberateness that the movement of each scene's elements has as they dance and oscillate in time with the melodies. "With Expand," says composer Chris Larkin, "We didn’t want to be bound by traditional narrative structures or characters. This is echoed in the soundtrack where core melodies create a slow emotional anticipation and, in combination with the minimalist art style, it allowed us to explore and evoke different moods without the constraints of a pre-defined genre or story." "Like the game design, the approach to composing the music has been that of intuition. Consequently the result is something that is very personal to us." I think I've found a word for that quality I couldn't describe earlier. I think it might be intimacy. It's clear that Expand is a labour of love and while I have never personally met either Chris, I feel somehow connected to them after playing an hour of this game. After a quick exchange this afternoon, I assisted Johnson in identifying and resolving a Linux specific multi-monitor issue. It turns out that he's a Linux user himself and that Expand was 90% developed on Elementary OS (I'm assuming that the remaining work was done on Windows and Mac whilst porting and fixing platform specific bugs). He uses Vim as his development environment and builds with Clang. It's always refreshing to discover a new Linux using developer, and this lead me to look at Chris' previous work. 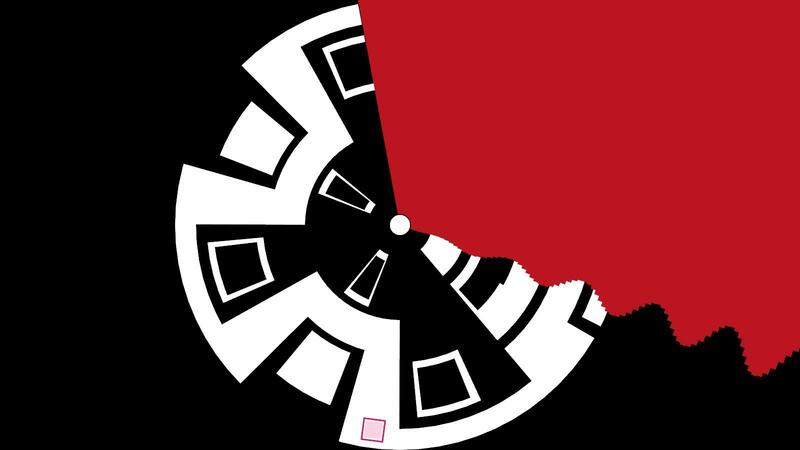 Pouring over Johnson's previous games, one in particular stood out to me, a monochrome game with a circular playing field called Everything Shall Come to an End, which was made for a game jam in 2010. It is simple and lacks music, but it's easy to see that the raw seeds of Expand were sewn back then, and have since grown into something polished and grand. "We essentially created Expand to highlight how a beautiful world can be created using only simple variations on game rules and environments," says Johnson. Expand will certainly not suit everybody. Its slow pacing and thoughtfulness set it well apart from games like Super Hexagon that may superficially look similar. I'm very glad to have spent time with Expand though, and for anybody else who's interested, the game is releasing today (the 30th of September or the 1st of October depending on where you live) for Linux on Steam, Humble Store and Itch.io. Quote Its slow pacing and thoughtfulness set it well apart from games like Super Hexagon that may superficially look similar. I'm glad to hear that, since I think Expand looks very interesting, but I was afraid it was too much like Super Hexagon, which I don't enjoy playing at all. Glad I stopped to watch the video, wow... Screenshots really do not do it justice. Linas Glad I stopped to watch the video, wow... Screenshots really do not do it justice. I wanted to include some animated screenshots, but they're a little too big for GOL's image system and I was wary of hosting them elsewhere. The style of movement and animation in the game feels really nice when playing. Like I said in the article, it never feels like it's reflex oriented or requires reactionary play - even when you have to move correctly, you have enough time to understand what those movements are, so the skill barriers never feel cognitive. There is one part towards the end of the "Elude" set of locations where you need to get through a longish sequence of movements fairly quickly. It's not until you reach the end that you realise that your speed up to that point makes a difference, but it's all encapsulated within one checkpoint and once you have that realisation, it's not hard to find the optimal path. Typo: "It simple and lacks music" -> "It's simple and lacks music". xyzzos Typo: "It simple and lacks music" -> "It's simple and lacks music". For anybody who might be interested, I had the developer drop in on a stream I was doing on the weekend, and we had a big long chat about making games, creativity, building engines, the relationship between discoverability platforms and distribution platforms, and a whole stack of other stuff (there are some spoilers here). The YouTube description has a detailed list of discussion topics and timestamp links.